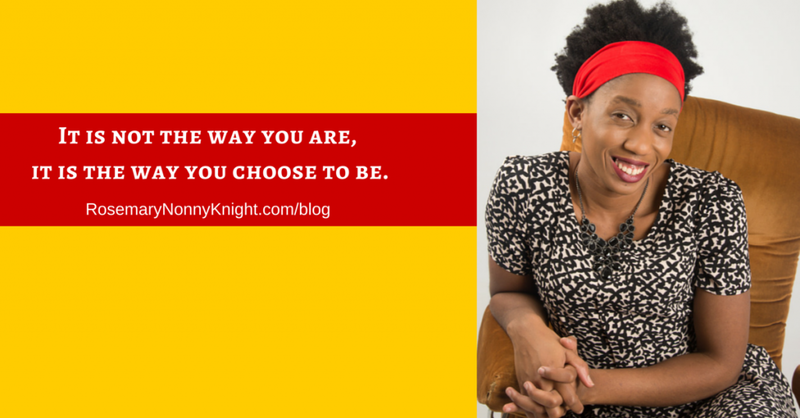 IT IS NOT THE WAY YOU ARE, IT IS THE WAY YOU CHOOSE TO BE. Have you ever used that statement? And do you really believe it? Probably you have not really thought about it, have you? It is just a simple way to absolve yourself of all responsibility for creating a life and business you actually like. Because when you face the truth about how powerful you could be, you get pretty darned scared about the possibility so it is easier to believe it is impossible and give yourself an ‘out’ by saying the way you are today is ‘just the way I am’. Well, no one can. If you decide that this is just the way you are, then I suppose you are stuck with it. I can give you a few ideas of ways to change things but unless you allow yourself the flexibility to believe that a new way of being is possible, then it is all in vain. You will give it a go for about a second and then you will go back to being the way you think you are. We have incredible power within us and yet because of fears, fixed belief systems and all the stuff that life has dealt us, we remain fixed in place. Scared to experiment with being our more powerful selves incase we make a mistake, in case we doom our eternal souls, in case someone does not like what we do. We remain stuck in place waiting & hoping for newness but not actually willing to do the work to get it. We think we are alone in the fear that we feel although we do not always see it as fear because we defend our position so vehemently, one would think we actually like where we are. We are convinced there is no other way to look at things and so we blame external circumstances for where we are. We say we are waiting on God to come and tell us to go, we use every single reason on the planet to keep our pain and suffering and wonder why it keeps going on and on. It is crazy that we fight to defend so hard a life that does not give us satisfaction. You claim to know that abundance is possible and yet, it is not evident in your life because again, you have decided that this is the way you are and there is nothing that can be done about it. Please know that nothing you do can separate you from love so allow yourself to do something new. It might just open you up to a whole new life experience, a better one, one that suits you better than this one that you settled for. You are not stuck with a personality that does not suit. Please believe that and begin to strip off the layers of resentments, pain, frustration, disappointments and all the regular stuff that we accept as normal. Try out a new personality for size and see what happens. You get to choose who you are. Choose well. Only you have to live with it.